Every Christmas, I list those companies who wipe away any mention of Christmas and ignore the faith community. It’s ripping Christ out of Christmas. I’ll give a list again in an upcoming issue. But now there is a slightly different list. It includes “Christmas” in its ranking. But it also includes a company’s support of pro-life views and treatment of Christian employees. It’s called Faith Driven Consumer. So far the companies nationwide have a miserable index average of 32, on a 100 point scale. 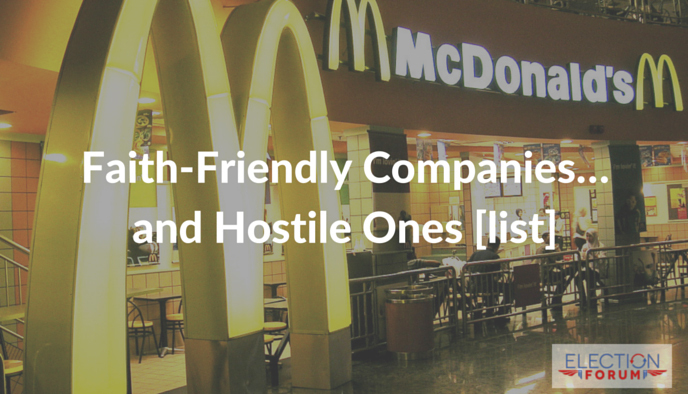 Note how many companies came close to the most hostile companies – Apple, Bank of America, Microsoft, and Starbucks. If Hobby Lobby and Chick-fil-A only score in the low 60s, what does it take to get 100? I TRY hard to avoid anti-American & anti-Christian companies. However, we are being squeezed like crazy. Yeah, there’s less and less competition in some categories, such as Walmart taking over most of our generalized shopping. I used to like Mervyn’s but they’re out of business, and there’s only Kohls left now for dedicated clothing. It’s depressing that so many businesses have gone under in recent years, giving us less choices of where to shop. My wife and I make a particular effort to frequent Chick-fil-A as much as we can because they are pro-Christian and their employees are so much more friendly than anyplace else we go to. Thanks to you Craig for making a list of these companies, because we have never found any rankings like this. It is interesting to me that Bank of America is the bank used by the State of California as the interim of providing state funds thru debit cards to disabled individuals receiving disability funds. I’m in an assisted living facility but, will forward your email to as many friends as possible.